Over time, the application of concrete epoxy coatings has become an essential part of maintenance and overhauling. 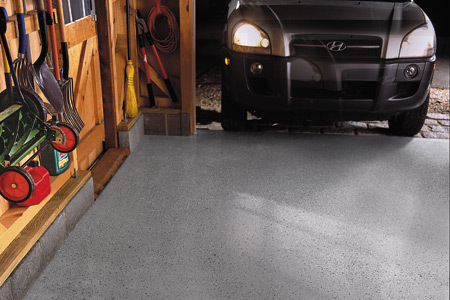 Considering the nature of paint, epoxy is used to coat the floors in garages and other areas that need protection from heat and chemicals. By and large, this is a DIY project you can complete easily once you understand the process. Why is Two-Component Epoxy Better? Use plastic: take a piece of plastic, maybe a large Ziploc bag, and tape it to the floor. Make sure that you do not allow any air into it. Leave it in place for a day and then take it off the concrete. Begin when dry: if the patch of concrete below is dark, or you find condensation on the Ziploc, then your floor is moist and will not hold on to the paint. You can only begin when it is dry. Spray detergent and water: the floor also has to be super clean before you begin, so moisten your floor. Next mix together a laundry detergent proportionately with 5 gallons of water and spray it all over your floor. Scrub the floor: spend a good amount of time scrubbing your floor with a bristled brush and then rinse off with a strong pressured water nozzle. Use degreaser: you may have a few grease or oil stains that persist. You can get rid of them by pouring a bit of degreaser over the stain and scrubbing it away. Use rough sand: put a bit of rough sand on it and press it down. Let it sit that way for a day. The next day you just have to sweep the sand away and your stain will be gone. So the paint sticks: this is an important part of the process because it opens up the concrete and allows the paint to stick to the floor in the right manner. Using a resurfacing grinder tool can help. Follow product instructions: most epoxy kits will come with their etching product, so all you have to do is follow the instructions. Or check with the store: if instructions are not provided you can always get it from an expert here at Runyon Equipment Rental. In batches: work in batches of around 6 X 6 inches at a time. This is important if you plan to use paint chips. Use aggregate: always throw them up into the air and have them land on the fresh paint, rather than flinging a handful directly onto the paint. The randomness you get is much better this way. You will have to use an epoxy joint filler to seal in the edges of the floor and can wrap up the process with a glossy coat of clear epoxy. The most important thing to remember is that you need to prep your floor the right way before you apply the epoxy. Also, following the instructions on the package to the ‘T’ is essential.